It was a colourful eye catching Christmas ride and lunch for those on the annual Friends of the Bendigo-Kilmore Rail Trail. Wearing the group’s new jersey colours, twenty members of the Friends group enjoyed riding sections of the extending trail in the Axedale area, for some, this was on new sections for the very first time. While stopped to view the new Axedale Platypus Compass, members heard about exciting local projects from Axedale Our Town Our Future’s President Yvonne Wigglesworth. Many new family friendly features of Axedale were highlighted, with Yvonne alluding to some exciting future plans. Stay tuned! 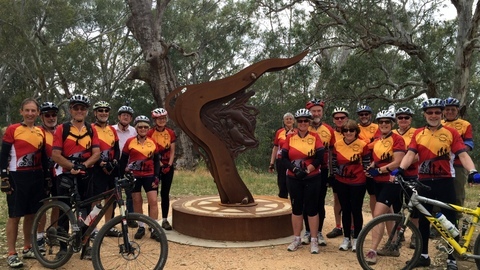 Riding the trail through the natural Campaspe River environment, with its water birds and large river red gums, members were keeping their eyes wide open for possible glimpses of platypus while riding over the impressive concrete trail bridge. Then to see roaming wallabies while riding within the Knowsley Forest, this said much about what trail users are likely to experience once the O’Keefe Rail Trail is fully connected from Bendigo to Heathcote in 2015. Of course another highlight for the day, was enjoying lunch outdoors under the shady trees at the Axedale Tavern while reflecting on the past year’s achievements. The trail’s new developments in the Derrinal-Lake Eppalock area was also a topic of discussions. While that particular under-construction area of the trail is not currently open to the public, it is hoped that the Heathcote to Derrinal-Lake Eppalock trail section will be open by the end of December 2014. Watch this space for trail news updates!